Consider the evolution of an activity such as computing infrastructure. Let us start with the genesis of the act of modern digital infrastructure (arguably the Z3 in 1943) and progress through the waves of improvement and disruption that have followed until eventually we end up with a commodity provided through utility services. The evolution of an act isn't a smooth process but has many released improvements each of which will diffuse in society. If you examine the diffusion curves for each improving version, they generally have different time length and market sizes (i.e. 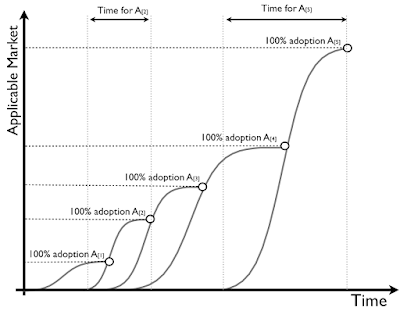 they're not uniform, each goes to 100% adoption of a different applicable market) - see figure 1. However, by examining ubiquity of an act and certainty (i.e. how complete, well understood and well defined an act is) then you can measure this progress of evolution. I've provided an illustration of this in figure 2. We have multiple custom built examples e.g. LEO as companies and individuals explored the potential. The act of computing infrastructure evolved (i.e. became well defined and widespread enough) that the first products (e.g. IBM 650) appeared. We had multiple waves of ever improving products. Some of these waves disrupted previous products - mainframe, minicomputer, server. Overlapping this time, we had the introduction of rental services. Computing infrastructure became so widespread and well defined that commodity servers were introduced (volume operations based, highly standardised etc). Being widespread, well defined and with a suitable delivery mechanism (the internet) then computing infrastructure became provided as utility services (e.g. Amazon EC2). Now, it's important to understand that the evolution curve is made from hundreds of diffusing and ever improving versions, some of which disrupted past examples and some which were incremental improvements. So, where is the chasm in this? There are many chasms not one. If you think back we've had chasms for utility computing, client / server, mini-computing, mainframe and even the original adoption of computing. During this time, computing infrastructure (as in the act) hasn't changed - it's still all about provision of compute processing & storage. Just the mode of operation and delivery mechanism has evolved. There was a chasm in the early stages (the original computers). 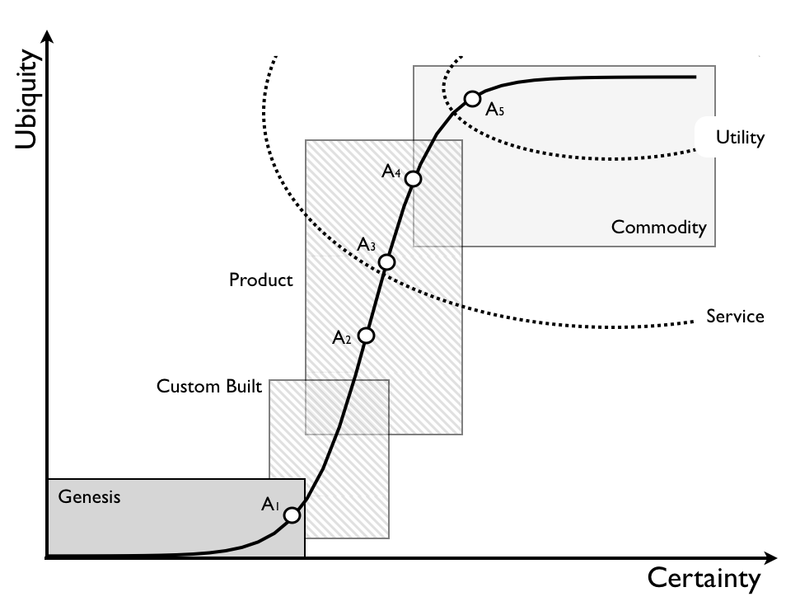 There was a chasm when computing went from custom built to products. The have been multiple chasms involved with each major product change (mainframe, minicomputer, client/server etc) as the act evolved. There was a chasm involved in the introduction of commodity servers. There was a chasm involved in the introduction of utility servers. If you're looking for the chasm involved in the evolution of computing infrastructure, I'm afraid you won't find one - you'll find many, almost as many as there are separate diffusion curves (for each evolving instance) and examples of incremental and disruptive changes. Fortunately, from a perspective of mapping - there exists only one evolution curve. Which is why we can map a business. 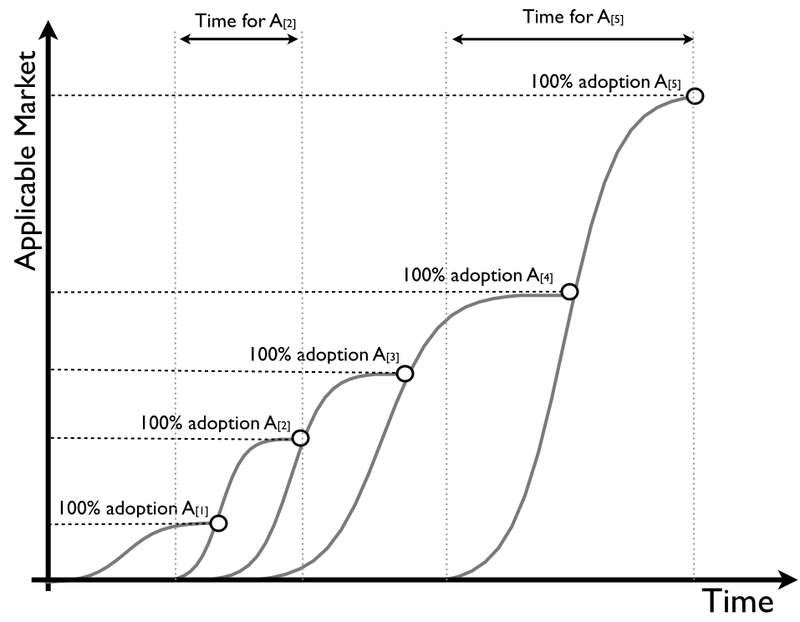 Without a single evolution curve then mapping would be impossible (this is why we can't map over diffusion, hypecycle, system of record / engagement etc).